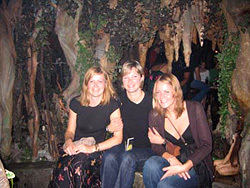 Home to one of our most popular language schools (and my very own big sister) Barcelona is always worth visiting, especially if you are living there as a student on a Spanish language course! I have personally visited Barcelona about 10 times now and even after being back home for just one week, I can’t wait until I have the opportunity to return again. There is just so much to see and do and experience for not only the tourist, but also those that live there, discovering new things every week or even every day. One of the most universally recognised symbols of Christmas is the traditional nativity scene: Mary and Joseph; the newborn baby Jesus; and the three Kings and other well-wishers that have come to bestow gift s on the child. However, in Catalonia, another figure hides at the back of the scene. 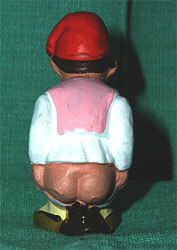 El Caganer is a uniquely Catalan character, who is depicted in the process of defecating. A humorous character, the caganer is not intended to cause offence. His place within the holy scene may seem a little strange, but in Catalan tradition this symbolises the fertilisation of the earth, and is supposed to bring a successful harvest for the following year, as well as luck and happiness to loved ones. Despite feeling nervous this morning before leaving the UK, I am now in Barcelona and I am delighted to say that the journey went very smoothly. I found myself in the city centre after a short and comfortable 30 minute journey on the ‘Aerobus’ from outside the airport costing only €4.75! Once I arrived into “Plaza Catalunya” it was a short walk to my apartment, which is located very centrally and is just on the edge of the stunning “El Barrio Gotico.” The apartment is very stylish, I have a large bedroom with a double bed and a desk, a bathroom with a bath and a shower and the walls are covered with beautiful paintings and traditional Spanish style rugs. Firstly, I would like to introduce myself: I am Genta and last year I took a Spanish course in Barcelona. I love this wonderful city! It has everything! The sun, the beach, the narrow and romantic streets, the bars and clubs, good food, festivals, the best football… You never get bored! I was lucky enough to be there during September and La Mercè. This is a local holiday throughout Catalonia and Barcelona celebrates every year with the festival of festivals, ‘La fiesta Mayor’! Last year, Barcelona celebrated its patron saint, the Virgin of La Mercè (the Virgin Mary) with live concerts, traditional music, dance, theatre, cinemas, street shows, circus and all kinds of different sports. I really enjoyed seeing the traditional Catalan dances, particularly the Gironese Sardana, and the castellers (human castles) were amazing! After living and studying Spanish in Barcelona for almost 3 months now, I am really starting to realize that this city has it ALL! 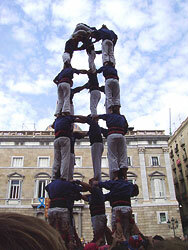 It doesn’t matter how, when or who you are in Barcelona, the city always has lots of things to offer! People from all over the world meet up here, studying, working, travelling and most important of all; creating the international, cosmopolitan atmosphere that you can’t find anywhere else! It is truly the city where two extremes get along perfectly, where you can go from the trendy, bohemian neighbourhood of Raval to the more posh and elegant Eixample in 5 minutes. Where you can have a 2 euro shawarma for lunch and a glass of Dom Perignon champagne in the evening. 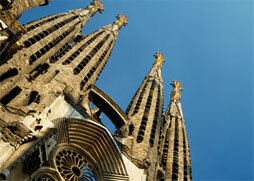 Where the old Catalan traditions are mixed with modernistic architecture into a glowing, colourful melting pot! WOW! I would give anything to be able relive my amazing experience in Barcelona! 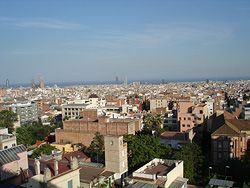 I just recently returned from my Spanish course there, and I already feel that I want to go back and live there one day. There is just so much to see and do that it leaves you wanting to do it all over again! From stunning beaches to bustling commercial centers and incredible architecture to picturesque parks, Barcelona has it all…and more! I fell in love with the intricate and clever designs of all of Antonio Gaudi’s architectural projects around the city: Casa Batlló, La Sagrada Familia, Casa Milá…and most especially Parque Güell. I could really see how groundbreaking Gaudi’s work must have been when the park opened almost 100 years ago…I was in awe with the brightly colored mosaics that cover the park terraces, the remarkable dragon fountain that greets you at the entrance, and the breathtaking view of Barcelona from atop the world’s largest park bench! I think it is about time that I tell you my genteel readers and loyal audience (yes I am talking to those two people actually reading this 🙂 ) about my living arrangements here in Barcelona. I, like many others here, am sharing a flat. We are four of us at the moment with two Spanish girls who work, a French girl who is currently learning Spanish and wants to soon start a semester at a university in Barcelona and myself. Luckily the French girl speaks very good German, so that makes my life easier. One of the Spanish girls does not speak any English, the French girl is only a beginner in Spanish and my reading is much better than my understanding, but with six languages between the four of us (Spanish, English, Bask, Catalan, French, German and a few words of Arabic and Italian thrown in) and a bit of arm waving and miming we manage to communicate surprisingly well! I might not start discussing astrophysics with the girls anytime soon, but then when does this ever come up in casual conversation with native German speakers? As I mentioned before, I was expecting to get many visitors here during my ‘exile’ in Spain. And indeed they came, or at least some of them. My mother visited me some weeks ago. Although I had to work most of the time when she was here we tried to get the most out of our time together. I am not really into the touristy things but for my mum’s sake I tagged along and now feel as if I have fulfilled my quota of cultural activities for this year. 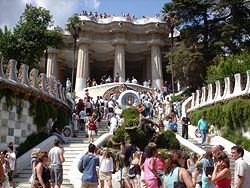 The first place we went to was the Parc Guell, which is quite close to the flat I live in. Being very famous it was absolutely packed on the particular day we choose to go, but I have to admit it was impressive. How impressive? Well my mum decided to finally find out how the camera on her mobile phone works (my mum has a better phone than me!) just so that she could take a few pictures including a fantastic view of the city. This is quite something, as my mum usually regards mobile phones and such as unnecessary technical gimmicks! Live it, see it and taste it all in Barcelona!!! I have been at the school for two weeks now on the intensive course and i love the teachers. The weather has been great so we had classes in the school garden which was great. it was nice to be out in the lovely garden and learning spanish. In two weeks I havent done everything because there is just so much to see and do in barcelona, that its so good to stay here a long time so you can really get to know the city but for a short time you also get a great taste for how it is here. Barcelona has so much to offer. also im staying in the student resudence which is amazing and right in the centre. 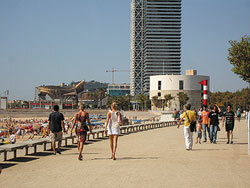 Discovering Barcelona and its visitors on a lazy afternoon. I finally took another trip to the beach last weekend. Here it is September and still beach weather!! I packed my bag and off I went. On my one previous trip to the beach I had had the glorious idea of walking. 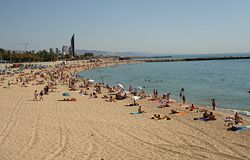 But the city centre of Barcelona is indeed quite large and I underestimated the distance to the beach from my apartment, which meant that, on arrival, I completely collapsed! But it was great to be there! Walking might be the best way to get to know the city, if you don’t get tempted and sidetracked by all the attractions on the way! If you are fit and have enough time (and a pair of comfy shoes) it can be fun, but if you are actually planning on arriving at the beach for some sun, then you can also just take the metro! A single ticket costs just 1, 25 euros, but I would advice you to buy a ‘T-10’ card (6, 90 euros), for 10 journeys on the metro, bus or local train! You can visit any place in the city so cheaply!